Laparoscopic Adjustable Gastric Banding (Lap-band procedure) is a minimally invasive surgical procedure which involves placing an inflatable silicone ring around the upper part of the stomach via laparoscopic (keyhole) surgery. The LAGB was first performed in Australia in 1994, and because no part of the stomach is stapled, removed or bypassed, the procedure is completely reversible. There are also very few issues with absorption of nutrients from food. How does the LAGB work? 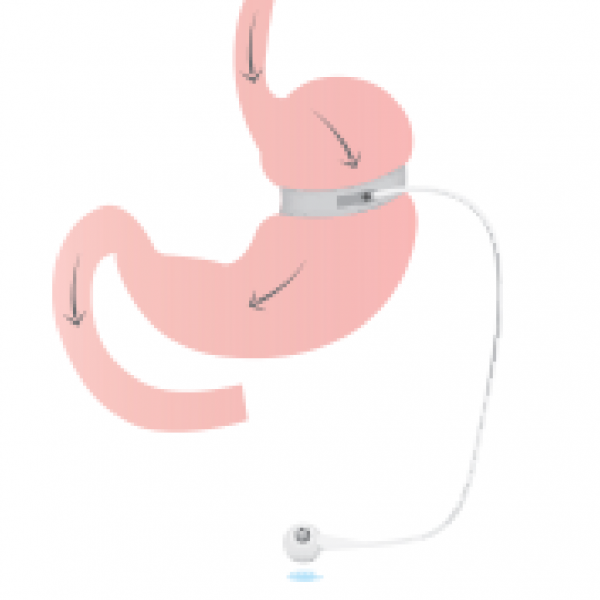 Restriction – The inflatable band limits the volume of food that can be consumed at one time by restricting the diameter at the top of the stomach. Induces early satiety – The constant gentle pressure at the top of the stomach slows the movement of food into the stomach, in turn giving the feeling of satiety (a sense of fullness) on a smaller amount of food. The gastric band has a small port attached, that is placed internally in the abdomen. Fluid (saline) can then be inserted or removed to control the restriction of the band. These adjustments (or ‘band-fills’) are performed more frequently in the first year, and then usually on an as-needed basis. The gradual, average weight loss expected with the Gastric Band is approximately 50% Excess Weight Loss (EWL) which is around 26kg. Although the Gastric Band can be removed, it is designed to be placed permanently. Do you currently have a gastric band but require a revisional procedure? We can facilitate the removal of the gastric band and conversion to either an Endoscopic Sleeve Gastroplasty or Gastric Sleeve Surgery.